# Tell us about The Sialkot Saga and what inspired you to write this book. The Sailkot Saga is a business story about two businessmen, one is a guy called Arvind who grew up in Calcutta in a Marwari family, and the other one is Arbaaz, who is brought up in the chawls of Dongri in Mumbai. Both led exceedingly different lives but one thing they have in common is their love for money. This book actually traces their life from 1947 to 2010, good 60 odd years. While these gentlemen are carrying on with their usual business shenanigans, what they don’t understand is that there is deeper secret that units them. That is revealed at the end of the story. It was my quest to examine the issue of man’s insatiable lust for gold. # How much of The Sialkot Saga is inspired from real life and people? Most of books, the plot is generally not inspired from real life but more of a theme. The theme of Sialkot, Business rivalry as a theme has been seen in the Bollywood movie Deewar or the Immigrant, there are multiple people who have explored the idea of a business rivalry.But many of the incidents that happen to these characters and the situation that they go through is inspired by real life — what I might have experienced or stuff that I’ve heard about. I give credit to the newspaper walas for the amount of inspiration I get from them too! #You were planning to write this one long time ago, but other things and books kept coming in between. Is that why you are calling this book a slow cooked dum biriyani? When you have a project that is a little too wide in scope, when I conceived it, it was a massive project by my yardstick. There is a parallel story that is set in the ancient times that covers emperor Ashoka whereas 90 per cent of this book is about the life of these two gentlemen. Now the problem is that. The period between 1947 and 2010 is the time which most of us had lived through. As a result of that, one can’t afford to say something that is wrong. I feel the need for accuracy goes up the moment you write about a period that is closer to the present one. As one moves backward into the ancient times, the need for accuracy declines. Mapping every incident to each year and figuring out what each of the character would have been doing during those times, to mapping it with what would have been happening in India at that time, what was the political backdrop, the historical backdrop and the cultural backdrop. Man who wanted to have Puchka Pani in Calcutta, I should know what was the cost of a plate of Puchka Pani in that year! That required a lot of work. That process of reading, interviewing people and plotting, that took about 18 months. While all that was going on, the crime thriller I did with James Patterson happened. It breaks the continuity, but it is possible to do that at the research stage, not in the writing stage. What should have gotten over earlier, stretched to about three years. #Writers often go away, cut themselves off from the world to complete a project. What is your style? Not me. This is my Karma Bhumi. Your Karma Bhumi is where ever you are. I feel even if you are focused on what you want to either research, or read or write, you will find the ability to do it. I have never found the need to go away to some other place to work. For me the way it works, in a normal day, I take out four hours for my writing and three hours reading and researching. It changes depending on whether I am in the midst of writing a book or whether in the middle of researching for a book. My writing hours between 5am to 9am, and my reading hours are between 5pm and 9pm. # Why have your book series been called Bharat series? My reader should know what category of book they are picking up. So Bharat Series is the ones that deals with the history, mythology, the political climate and business, and very much focused on India. I am working on a ’13 step’ series and “Private series” with James Patterson. 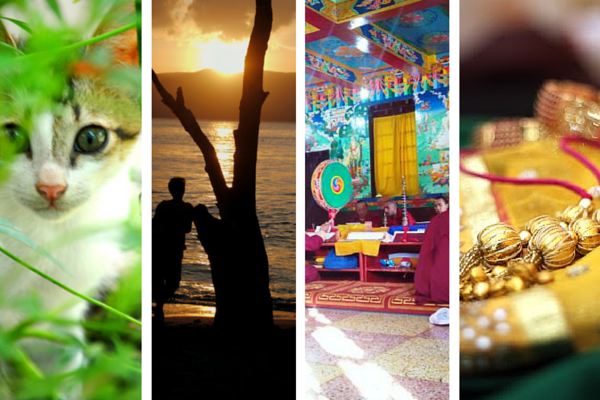 # Writing trends in India have lately been falling into some set categories. Which genre has a lot of potential? One category that has not developed in our country is science fiction. According to me, there is a huge scope for that. In the west, crime thrillers take up the first five position in any bestseller list, but in India, you will rarely find that. Here, it will either be the mythology book, or romance books. I feel that we have only scratched the surface when it comes to thrillers. This is a specific section where I feel there is a dearth of books in our country. # How do you react when compared with Dan Brown and Jeffery Archer? First reaction is one of being absolutely flattered. Brown and Archer are master storytellers, I have loved each one of their books. It gives a great sense of satisfaction when my work is compared with theirs. The Dan Brown comparison happened with me when my first book Rozabel Line was published, which was in set in Kashmir. The story involved Jesus Christ and Mary Magdalene, everyone said this is a desi Da Vinci Code and Ashwin Sanghi is a desi Dan Brown. Similarly, Jeffery Archer is a storyteller that I don’t think the world has ever seen. He is at a completely different level and it’s a childish comparison to make. I can write another 20 books and I will still not be Jeffery Archer. There is one part of me that wants be happy about these comparisons, another part cautions me to not get taken in by these compliments. Sometimes I wonder why these comparisons are being made? Are foreign authors called American Amish Tripathi, English Ravi Subramanium or the French Ashwin Sanghi? # Fact that sounds like fiction and fiction that sounds like fact? Is that what is behind every book of yours? Yes, I always try to bring a factual element and weave them into the story. For example, in The Sialkot Saga, one of the characters that makes an appearance is Atal Bihari Vajpayee, in addition to PV Narsimha Rao. There is a scene of a person traveling from Bombay to Hyderabad and he just drops in to meet the pilot in the cockpit — who turns out to be Rajiv Gandhi. Similarly, historical and cultural events of that time also form a part of that story. So even though, you are just enjoying the story, it sounds that much more real because the backdrop has changed to the time when that character was alive. I would say Sialkot Saga is a lot like my previous book Chanakya’s Chant — which was a story of conflict in the world of politics — so this is a story of conflict but in the world of business. # Next book that you are working on? 2015 was the most strenuous year as I was not only completing The Sialkot Saga, but was also finishing up a crime thriller, which is likely to come out before the end of this year. I suddenly I feel like I have a lot of time on my hands this year! Excerpts from this interview first published in Pune’s Sakal Times Sunday Plus 4 on May 22, 2016. Ashwin Sanghi photographs provided by publishers Westland . “All that glitters is gold” screengrab from Sakal Times epaper. Three women, who have quit their regular jobs to become writers, meet in Greece, one of them desperately tries to figure out intricacies of love — that’s Runaway Writers for you in 140 characters (well, 144 to be precise). That is probably how Amby — the main protagonist of this book and a Twitter expert — would have described this book. The story of Amby is something many of us can relate to. She has the potential to make tons of money through a banking job. But is currently doing some creative tweeting for a famous movie star, in the hope to become a famous writer herself. As the book repeatedly emphasises, we are all looking for the second best job in the world — something that is creative, satisfying and pays decently. Which is why Amby wants to go to Greece to attend a writer’s workshop, so that she can quit the ghost-tweeter job (yes, that’s a job, as Amby repeatedly explains) and start writing that bestseller she is destined to write. She is joined by two more women, equally eager to pursue their dream of becoming a writer, on this trip to Greece. The book is a chick-flick, a travelogue, a writer’s “how-to” guide, and a love-story all rolled into one neat package. Divided into two sections — Before Greece and After Greece — the book focuses on Amby’s life in a typical Chennai family. She has a secret crush on her boss, the movie star, but is torn between the mixed signals she keeps getting and the match her parents are pushing her to consider. The new guy is a well-settled Tam Brahm living in Finland, and after a couple of online meetings convince Amby that he is truly Mr Eligible. Meanwhile, Amby’s pursuit of her dream of becoming a writer kindles the spark in her boss to chase his own dream of becoming a chef and opening his restaurant. And so, Amby is confronted with the question: Who is a better option? Mr Eligible or Mr Edible! The author’s wit and ability to connect with the new-age reader has made this book a good read. Runaway Writers is that kind of book which will instantly lift your spirits. Writers — anyone who writes, reports, tweets, posts and pitches — in particular will instantly connect with the book. The details of the writers’ workshop are simply awesome, almost made me quit my job to look for something similar in some exotic land. We cannot help but wonder if author Indu Balachandran, an advertising veteran who became a travel writer and columnist, has written her own experiences of this journey of chasing the ‘second best job in the world’. But if that is the case, then there is hope for many of us who are still stuck in our ‘best jobs’. Do not feel disappointed if the cover illustration gives you an impression that it’s a story of three writers. Though the other two runaway girls are at best bridesmaids in this delightful read, you will find enough in Amby’s life (whose real name is Ambujakshi, by the way) to chuckle, smile, love and take inspiration from. This book review was first published in Sakal Times, Pune, on February 14, 2015. Oh dear! 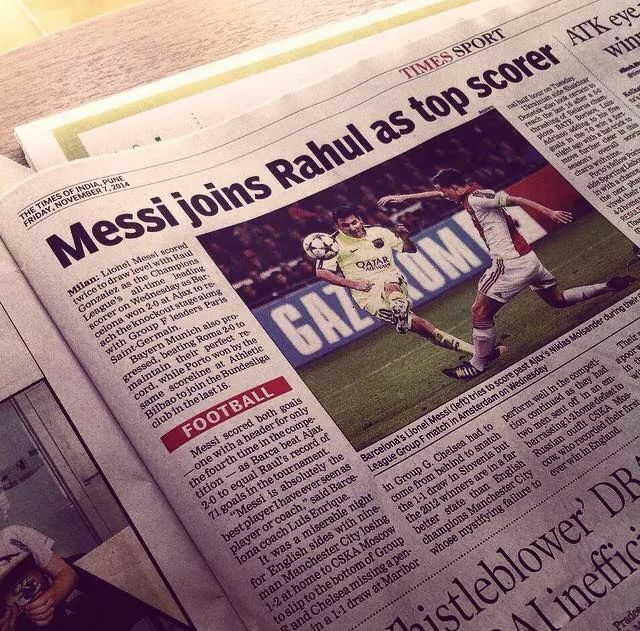 Times of India’s Pune edition got Raul confused with the Gandhi scion it seems. Now I have an issue with designing of belly of this page. These two different stories look hilarious to me (and one too) because of collision of the two headlines. The fonts are almost the same, but font size is what ruined it. The first headline, roughly translated, says,”Polling comes to an end for 117 seats”. The other one reads: ND Tiwari is Rohit Shekhar’s father”. Trasnlation: ND Tiwari is Rohit Shekhar’s father only for 117 seats! (Eyes pop wide open and I almost spilled my tea). 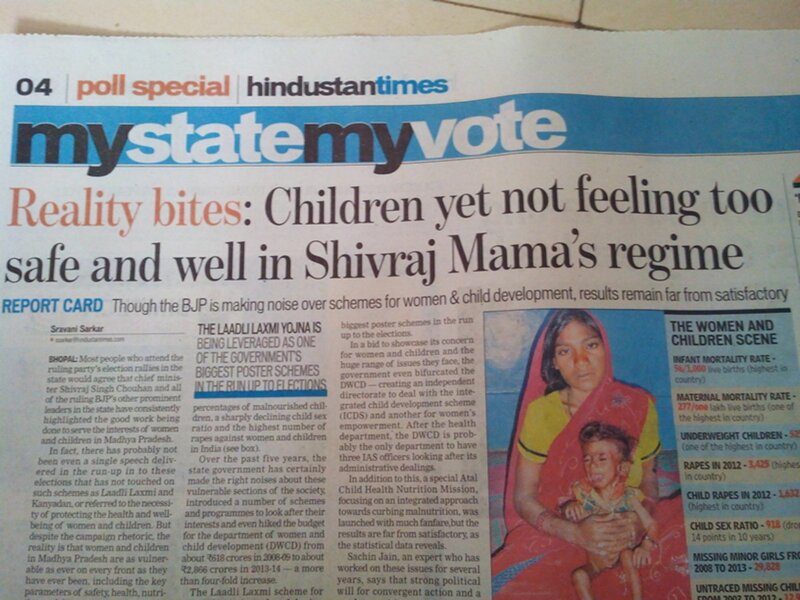 Hindustan Times Bhopal edition’s headline on page 4 on Nov 15, 2013. A classic case of filling up more-than-required space with wrong English.